Please note that additional user setup may be required to turn on U2F functionality. For more details, please head to yubi.co/unlockU2F. The YubiKey NEO works with both U2F and OTP-compatible services such as Gmail (U2F), LastPass (OTP) and Salesforce.com (OTP). In addition, the YubiKey NEO supports NFC communication for access to mobile devices, Yubico SmartCard applets and Mifare Classic. The YubiKey NEO fits nicely on a keychain and can be used with any device that has a USB port. 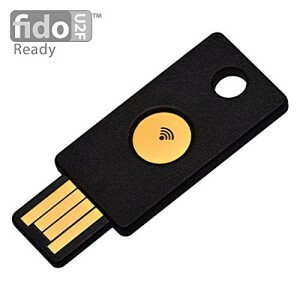 Using Yubico’s personalization tools, the YubiKey NEO can be configured for use with Yubico One-Time Password (OTP), OATH, Challenge-Response, and Static Password. The YubiKey NEO can hold two independent configurations of any supported type. * Currently sold YubiKey NEOs do not support the development or management of JavaCard applets.